The day started with a long wait for a bus. I do miss listening to the radio in the car on the way in. Competition for spaces in the work car park isn’t an issue this week! Though parking is on the mind of the local residents who were voicing their concern again this morning about the plague of all-day commuter parking in the Markets area. 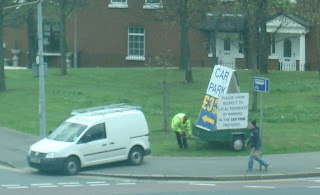 Whether added by the residents or the nearby car park, the extra notice on the advertising trailer made their point. The PSNI helicopter spent part of the morning buzzing the area flying in low. Maybe they were looking for a space? The day had a moment of decisiveness. O2 phoned up to ask if I was happy with my tariff. And I cancelled the contract there and then. Only took a couple of minutes and talking to three people to thread my way from sales to accounts and finally to the cancellation team. I’ve had the number since I first got a mobile, but had more recently switched to a data tariff for occasional online use. But not enough to warrant the monthly charge. The day also featured a queue in the main Belfast Post Office at lunchtime. About fifteen minutes to reach the front. Passport renewal time. Which means it’ll be ten years in September since I went to India with work. Handing over the paperwork, photos and old passport, the woman checked my form and sealed it in its envelope. It’ll be posted across the road to the Passport Office! I’d three full bags of coppers in my pocket – planning to lodge them in the bank on the way back from lunch – but the Post Office happily accepted them as part payment for the passport renewal, with the balance squeezed out of a credit card. The day nearly involved a bus crashing into a car that at the last minute threw itself out of a side street and into its way. A shocking piece of driving. Annoying too to be held up by parked cars in the urban clearway zone. The view from the top of a double decker bus is fascinating. The amount of clobber thrown up on top of bus shelters could inspire a new Flickr group! The day didn’t end with a tip to CIYMS and the local Post Office closure public meeting. Story time was the priority. But if you were there, do leave a comment to describe how the meeting went? A more positive story about buses – thank you CIE! Having had a go at Translink this morning – and omitted to congratulate the driver who let me get off two stops early when I’d naively asked him where the closest stop to Belmont Church Road was – here’s a more positive post to balance what could quickly turn into a ranty week. We had two houseguests staying for the last ten days. They spent a night in Dublin, and one accidentally left her sleeping bag on the bus. Realising what was missing, they nipped back to the bus station a couple of minutes later, but the bus had already turned around and departed. They checked the Lost Property office in Dublin on Saturday on the way home. And they found the Belfast Lost Property closed when they finally got home. Tip: The Lost Property for Translink buses is the Parcel Office – on the forecourt, opposite the bus departure gates. It’s not (well) signposted, but that’s where it is. The visitors flew back to Paris and their work at Taize this morning, but I finally tracked down the turquoise and purple sleeping bag to CIE’s Dublin Lost Property after lunch, and the kind man offered to throw it on the 16:00 bus heading north. Only problem was that I had to beetle down to the station to meet the bus, as the parcel office is closed after 17:30, and lost property disappears into an unstable wormhole. The bus pulled in to Europa right on time at 18:30, and once everybody got off, I poked my head in the door and asked the driver if he’d been given a sleeping bag. And voila. There it was in the locker beside the door. So thank you CIE for an efficient way to smuggle a sleeping bag back to Belfast. Now to give it to someone heading out to Taize! It was no April Fool when I posted on 1 April about the Post Office’s planned closure of the Campbell Park “Belmont” branch (situated on Belmont Church Road). There’s an open consultation on all the Northern Ireland proposed closures. You can write in with comments until 12 May. 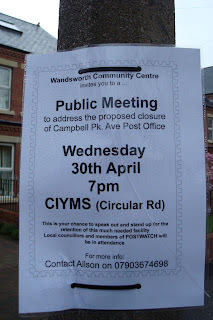 In the meantime, Wandsworth Community Centre has organised and publicised a public meeting of local residents and businesses in CIYMS (on Circular Road) this Wednesday at 7pm. Local councillors as well as members of the local Postwatch committee (the postal watchdog – they’ve got a blog!) will be there to listen to local responses. Midnight Man - conspiracy alert! I’m a sucker for a good conspiracy drama. The Last Enemy was excellent stuff. The best ones seem to get cancelled early – like Channel 4’s Ghost Squad and Cape Wrath! So ITV’s new vehicle for James Nesbitt, Midnight Man, looks interesting. Nesbitt plays Max Raban, a failed investigative journalist searching for stories to sell to tabloid papers. Raban suffers the debilitating psychological disorder phengophobia – an abnormal fear of daylight – which reduces him to bin hoking at night. Like all good conspiracies, there’s lots to go wrong. His estranged wife is murdered, he’s framed for the crime, and becomes a fugitive. However, discovering that a death squad is at work makes him determined to expose the truth about the brutal killers. Let’s hope it’s good enough to last beyond its initial three episode series ... particularly since Nesbitt isn’t going to be Doctor Who after all! Starts Thursday 8 May at 9pm on ITV. A tough slot, up against The Invisibles (BBC1), Heroes (BBC2), Grand Designs Live (C4), House (five), Bones (Sky One) and the wonder NUMB3RS (ITV3). Catching a bus ... first you need a ticket! So having utterly failed in last year’s resolution to catch the bus in and out of work at least once a month, I’ll be making up for it this week. Although I have a Translink Smartlink card, it’s not so smart as the Oyster card that lives in my wallet for transport around London. 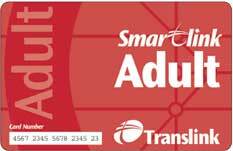 For although I’ve unused journeys on the Smartlink card, they expire a certain number of days (three months) after being purchased. Not even after a certain gap in card use. You could use the card on Day X-1, and then find that on Day X it’s useless even if you still had unused credit journeys in it. If it wasn’t for the Terms and Conditions, you’d be tempted to call it theft. It’s a system racked up in the favour of Translink and not the customer. Umm. Shouldn’t the purpose of a non-privatised integrated transport company like Translink doesn’t seem to be to run a quality set of integrated transport routes that are customer-focussed, and encourage customers to keep using them. When I left the house this morning the rain was over so I wandered down to Ballyhackamore’s shops to recharge the card rather than pay over the odds on the bus. But at 8am, the newsagent was closed. Walking further down to the BP filling station that is like Ballyhackamore’s shopping mall with Subway, a Post Office branch and a Spar tucked into it’s forecourt. So I went back to the bus stop and paid my £1.40 at the door (a number 19) before taking a very windy route down North Road towards Central. 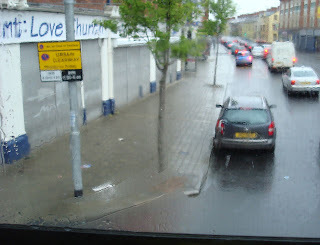 Sitting at the window upstairs, at least the bus lanes were working to the bus’ advantage! Does anyone else wish that the Smartlink cards would hold credit rather than just journeys? Or am I the only person who’s infrequent bus usage means that it always expires before I finish a card? Do let me know. Half way down the steps, the bus drove off! Though there was another opportunity to get off at the proper bus stop on the other side of the lights. Saturday was dominated by cars. On the way back from Belfast to Lisburn to pick up Littl’un, I noticed that my car’s fuel gauge had suddenly gone from saying 2/8 to showing an empty fuel tank. It’s not a big car, so the tank isn’t particularly large – you tend to get about 200 miles out of it. Yet the hard-to-rely on range display was saying I could go for another 71 miles on what was left in my tank. Umm. Suspecting a software fault, I decided to pull off the Malone Road, turn off, turn back on (though since it’s not a Microsoft Car there’d be no need to actually get out and slam the doors before it would reboot – like the old joke that used to circulate by email) and see if that fixed the problem. Coming down the hill, I indicated, pulled into the quiet side street, stopped at the kerb and turned the key to cut the engine. The noise of cars hitting each other out of view. Switched the ignition back on, and the proper low fuel warning came on this time - so definitely down to the last few litres of petrol. Quick U-turn, and back at the give way onto the Malone Road. The two cars that had been in front of me, had run into each other, just seconds after I’d pulled off the road and into the side street. Both drivers were out of their cars and seemed ok – other than a certain about of finger wagging and surveying the wreckage. A rather bent bonnet and . I’m not sure what had happened – hopefully not the distraction of a Smart Roadster disappearing from their rear-view windows. But I was certainly glad that I’d randomly pulled off the road, and didn’t add a third car to the carnage. I’ve no wish to test out the Smart’s air bags or safety features. It nearly feels bad to want to thank God for removing me from the possibility of careering into the two cars in front of me – after all, he didn’t exactly stop the Dublin reg car banging into the rear end of the silver grey car in front of it – but I was particularly thankful to be able to get to Lisburn on time in one piece. Friday had been dominated by Armagh. It was a bit crazy. I spent the best part of the day in Armagh – in the well-equipped Market Place Theatre. Note to Armagh Council – you need a lot more brown signs up to direct people to the theatre to catch the drivers who misinterpret the first confusing sign on the way from Portadown into Armagh. Oh, and can you fix the ticket machines in the multi-storey car park adjoining the theatre. Only the one on the ground floor is working. I arrived home from Armagh, just as my wife set off to spend Friday night and Saturday in an Armagh Hotel at a conference. Pity I hadn’t stayed and taken her place! The phone call came through as I was starting story time and the wind down towards Littl’un’s bedtime. The Polo had overheated and was parked up at the side of the road outside Portadown. One of those cases of offering every support short of actual help. So I supplied the number for the AA – a wonderful organisation that allows you to join and request their help all in the one phone call – and went back to the latest batch of library books, helpless to physically rescue the situation. The AA truck towed the Polo to Lisburn and Cheryl got a lift home. (Expect a blog post soon about how stressful that is over at Cheryl Wonders. But it’s at times like these that you really regret driving a two seater! It’ll be the bus for me in and out of work this week, and a taxi to the airport on Tuesday. 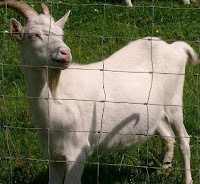 It also meant that the plans to pop across to Fitzroy in the morning to meet up with mapgirl followed by a trip up to the north coast and the Giant’s Causeway with our house guests boiled away – much like the water that’s meant to cool the Polo’s engine. And since the weather was good, and travel was impossible, we wandered down to The Point and gorged out on their lunch menu. The Cottage Pie had no slates or bricks, but I’d still recommend it. 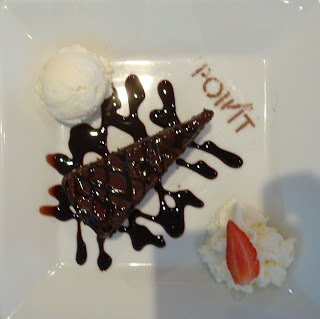 Dessert was hard to say no to. 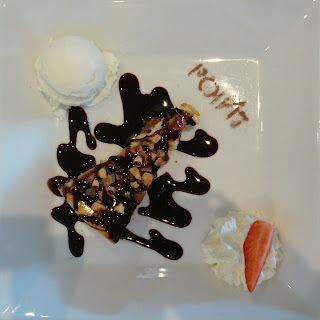 And the service is very quick and very friendly, even allowing for the eating habits of a three year old. One thing that really irritates me is bad parking. Particularly, pulling into the convenient parent and toddler spaces without having any children in the car, or parking unnecessarily across several spaces. There were several examples of the latter at Secret Sainsburys yesterday afternoon, but this was the best. Maybe some brands of car just need extra white space black tarmac on either side to set them off? I stumbled across a remarkable story this evening. First was the story of Nicholas White who was trapped in a lift in a New York building for . The security camera footage of his incarceration is on YouTube, and there's an extended piece in The New Yorker that explains what happened along with the unexpected repercussions. The article is fascinating, full of details about how and why lifts (elevators) work the way they did. It reminded me of a post I recalled writing a year or so ago on the lifts in the Gherkin. But could I find it? Eventually it turned up as a draft post last touched on 12 January 2007 and never quite published! The post was to be based around a selection of photos taken in and around St Paul's Cathedral in London. But the nugget I remembered was about the two-stage lifts. Now writing in a blog entitled “Alan in Belfast” I should probably be posting about St Anne’s Cathedral (conveniently built in Belfast’s Cathedral Quarter) ... but spending so many days and nights working in the centre of London, the shadow of St Paul’s Cathedral dominates more than the Stan’s more modest Cathedral in Belfast. That and the sight of 30 St Mary Axe (better known as “The Gherkin”) popping out from the ragged skyline of grey buildings. Trivia: There’s a bar on the top (40th) glassy floor of the Gherkin. So it wasn’t possible to put the lift winding gear on top of the building as normal. Instead the architects designed one set of lifts that go up as far as the 34th floor, with a smaller lift pushed up from underneath to reach the upper floors. From 39 up to 40 you’ve got to walk up the marble stairs, or use the stair lift. No wonder that Charles and Di favoured it over Westminster Abbey for their wedding back on 29 July 1981. Sky One has green lit the development of two 60-minute scripts based on the classic science fiction series Blake's 7, with a potential to extend into a series. It's being called a reimagining ... in the sense of how Bionic Woman was recently remade by NBC in the US. Though it won't be the same without the risk of wobbly sets. Update - The Guardian have helpfully provided a gallery of shots from the original four series. Terry Nation created the original series and B7 Media now own the licence to the show and their Blake's 7 Productions subsidiary is working with Sky on the new production, following on from their production of new Blake's 7 audio dramas. Big bang switchover? Not quite. When I saw the headline and first sentence snippet of the article below I nearly gasped in amazement. Amazing. Just one set of switchover adverts. One big consumer push. One big bargain sale in Currys to get every household kitted out with a Freeview box. One last minute frenzy for household aerial fitters across the land. And then someone in Digital UK HQ would hit the big red button and switch off all the analogue transmitters, and push the green button to turn on (or boost the power) of the digital ones. A ceremony that could be televised on all the UK channels - even though some might loose the picture half way through! Like the turning of the millennium all over again. By then I’d clicked through to read the full article. And my imagination stopped dead in its tracks. The second part of that first sentence went on to tell a very different story. ... continuing with the existing two-stage process. Digital UK said there had been mixed feelings in Whitehaven, the Cumbrian town where the five-year switchover project began in October, about the decision to switch off BBC2's analogue signal four weeks ahead of the other terrestrial channels. They switched BBC Two over first. Which meant that people who hadn’t paid attention to all the switchover advice, leaflet drops and local coverage only lost one out of the five channels, and had time to respond before the other four were lost. The switchover body said the process had created confusion for some people and had forced viewers to "toggle" between analogue and digital services to access all channels during the transition period. Some 49% of respondents to a survey in the Whitehaven area said they would have preferred a single switchoff date. Just 23% favoured the way it had happened, with another 28% neutral. ... But Digital UK urged caution, pointing out that for older or vulnerable consumers the "grace period" offered by the two-stage process had been beneficial. So Digital UK are going to take a cautious approach and shrink the BBC Two only phase down to two weeks for the Selkirk transmitter switchover in the Scottish Border region in November. And they’ll also consider whether a single all-in-one switch over for later regions is possible (or advisable). No big bang after all. In case you're wondering - along with London, Northern Ireland's down for switchover in 2012. The hymn boards caught my eye as we sat down at the wedding this afternoon. One side displayed 28 02 83 while the other said 07 07 77 - the couple's dates of birth! Later on Elvis sang How Great Thou Art (DVD version) after the couple signed the register, as people hummed along. A wonderfully relaxed wedding. A celebration of God uniting a young couple. A celebration of their creativity, their joy, their sense of humour. Quickly through security, and a run down to the bmi desk at the gate. "No chance. Flight all closed." Run back, up the stairs, along the corridor, into the bmi lounge, down towards the ramp. Different story. "I'll check for you. Just wait in the lounge and I'll be up." And after two minutes, I was ushered on board. "Hope you don't mind the over wing exit row?" "Not at all - delighted to be not waiting two hours in the lounge for the half five. Thank you so much." So a shared Heathrow Express into London and a cab round to Marylebone. Arrived in time for dinner, as opposed to sometime after the starter! Thank you Katrina and Stevie for sharing your big day. For sharing your hopes, your faith, your passion and your love. And thank you bmi lounge who can pull off miracles with grace and a smile. Update - review of the opening. Next instalment of the long-running (yet inconsequential!) saga of where’s the Belfast Apple Store going to be in Victoria Square? It really doesn’t matter, and I really don’t care. But a serious number of folk hit Apple-related posts on this blog every day, either searching for jobs or the Belfast store. 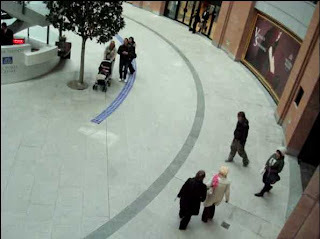 So HT to Brian and Geoff for noticing the activity around unit UG5, and the nice people at Victoria Square this morning for confirming the suspicion that this would indeed be the site for Apple’s temple of glass, aluminium and white plastic in Belfast. Any bets on Belfast getting a bespoke spiral glass staircase? A Mystery Worshipper called past in February and wrote up the experience for the excellent Ship of Fools website which has recently added a raft of new reviews. Meeting monthly in The Black Box arts venue, Ikon is a Sunday night church experience religious act with a difference. Their website promises that Ikon will iconic, apocalyptic, heretical, emerging and failing. It’s arty and creative, can even feel pretentious before you get over yourself and let go your Northern Ireland reserve. With a supply of Nietzsche and Kierkegaard, poems, visual and participatory art, Jesus does turn up. April was titled We have decided not to die. Ikon meet again on 18 May. I’m sure they’ll give you as good a welcome as the Mystery Worshipper received. Doors (and the bar) open at 8pm, and the organised part of the evening kicks off around half eight. On Saturday, Ikea celebrates its 21st birthday, and will be offering 21% discount in its stores (but not online) throughout the day. So if you fancy joining the Sydenham Bypass flash mob in a gigantic freeze tomorrow, park your car up on the the A2 and enjoy the car radio. You'll not be moving for hours!!! 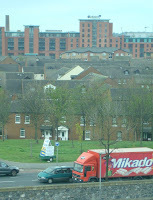 Update - Saturday - The final approach road after the Sainsburys' roundabout seemed to be the only slow traffic. And if you want to try something else instead, William Crawley's reckons if you turn up at the door of Blackstaff Studios on Great Victoria Street on Saturday or Sunday, you'll be able to get into the Blueprint Exhibition without a ticket. And if you were thinking of popping up to Streamvale Open Farm, it'll be closed this weekend as a precaution while officials try and track down the source of an E.coli outbreak in Belfast. "The source of the infection remains unclear and the EHSSB stresses that the risk to the wider community remains very low," Judith Morrow said. "We are confident that our intensive cleaning programme over the weekend will further reassure the Health and Safety Executive (HSE) on Monday and that we will immediately reopen for business." Update - Monday - And I'm glad to read that Streamvale were able to reopen on Monday. 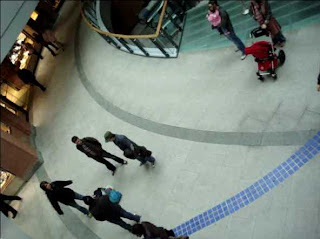 Belfast Flash Mob ... this lunchtime in Victoria Square ... kind of a mini-mob! 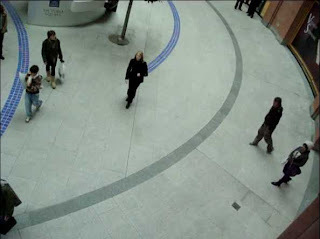 At 1pm, a short quiet blow on a whistle triggered some of the shoppers in Victoria Square to stop, frozen in time. And for two minutes, they stood like statues, while shoppers and the centre’s customer service staff wondered what has happening. Truth be told, it takes a lot to disturb a long-time resident of Belfast, and quite a few folk just wandered on past the static figures without even batting an eyelid. But at least a few turned back to wonder! 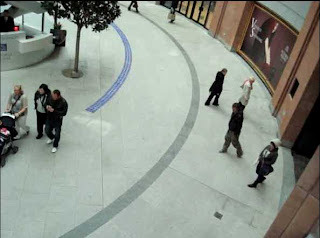 Belfast’s first flash mob ... I’ll update with a link to Youtube when someone uploads a video. Update - There's something quite geeky yet potentially liberating about the whole absurd concept. Meeting up with hundreds of strangers to sing Rick Astley in Liverpool Station is fairly anonymous. Yet appear at lunchtime in the middle of Victoria Square and someone from work, or your Aunt Wendy will happen to wander past, leaving you with a lot of explaining to do. Hats off to those brave enough to participate at lunchtime. Phil has some photos. Davy got there too late. And it was hard to hear the whistle. Numbers would have been larger at lunchtime if the whistle hadn't gone off a little early, before everyone had arrived! Email belfast dot flash dot mob at gmail dot com or befriend Belfast Flash-Mob on Facebook to hear about the next event ... 3rd May at 2pm in Belfast. Shhhh. Update - Fri 2 May - found the video of the first Flash Mob. Watch out for the second one tomorrow in Cornmarket (Arthur Square) at 2pm. Belfast City Airport is struggling to keep out of the news at the moment! The Air Accident Investigation Branch have reported on the Flybe Dash-8 that was on its way across from Edinburgh to Belfast City on the evening of 10 December 2006 carrying 71 passengers and four crew. The flight had to make an emergency descent from 16,000 feet down to 8,000 feet when cockpit instruments failed. Rather than turn back, the crew continued towards Belfast at low altitude and landed safely. 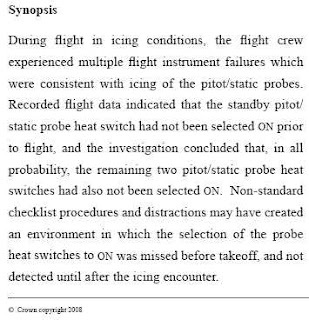 The report determined that at least one of the heaters that keep external sensors from icing up had not been switched on in time. Belfast City Airport will soon be conducting one of their regular emergency simulation exercises to practice coordination of police, fire, ambulance and airport teams. As I’ve driven into work down the Holywood Road the last few mornings, planes have been consistently coming in to land over South Belfast. I kept thinking that it would make a terrific photograph as they disappear in behind Holywood Arches Health Centre, or appear out of nowhere above Wyse Buys. “The airport tells us that 80% of our flights use flightpaths over Belfast Lough, which minimises noise in residential areas”. Nor did bmi come back with more details about their barcode check-on trial that’s starting in Belfast City Airport in May. Combining aspects of those last two threads was today’s report on Good Morning Ulster about bmi’s call for an extension to the airport’s opening hours to allow their final flight to land later and better serve the business community who would appreciate 30–60 extra minutes in London and better connections with evening flights coming in from Europe. Local residents were interviewed on the Ormeau Road in a lull between early morning takeoffs and the next rush of aerial activity around 9am. There was a notable absence of participation from bmi and Belfast City Airport (who had been invited). A desire for later flights was something that the airlines were asked about in the 2004–6 public examination of the Planning Agreement. 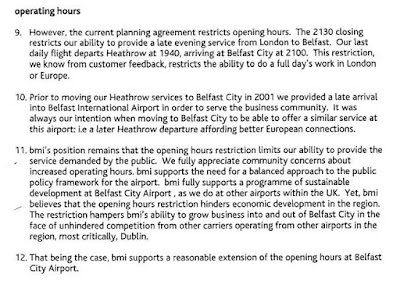 Back in January 2005, bmi outlined their position, consistent with this morning’s report about a desire to see an extension to opening hours. A political party with a position paper on post primary transfer ... why are other politicians so surprised by what Sinn Fein think? It’s rare to get an insight into the contemporaneous machinations of a political party. Usually, it’s only when the memoirs are published that the political thinking and dark arts are revealed. Most organisations write position papers (or briefing notes) about various subjects. It’s a way of getting the experts to put the state of an issue plainly down on paper, so that it can scribbled over and changed, discussed and debated. So when Sinn Fein’s recent internal briefing on Post Primary Transfer found its way into UUP MLA Basil McCrea’s hands, and then onto the front of this morning’s Belfast Telegraph, it’s interesting to see the party process in action. This group is unable to speak with one voice because of the different views within it. Whatever the ins and outs of how the post primary transfer changes are currently being negotiated (or not), and whether there’s enough transparency in the process, some of the points in Sinn Fein’s briefing show the inequality and imbalance of the current system. Of the 69 grammar schools in Northern Ireland, the paper claims that 26 have at least one third of their intake coming from grades B2, C1, C2 and D. Only 7 restrict their intake to grades A and B1. Grammar schools are sucking more and more children in through their gates—40% of children, rising to 45% by 2013/14—at the cost of secondary schools, who then suffer from falling rolls, fewer staff, smaller subject ranges. One set of schools bunged full and another set decaying. Maybe the grammar sector will suggest expanding to take in all pupils and completely eliminate the secondary sector! ... Sammy Wilson has suggested that grammar schools should only be allowed to accept pupils who reach a high academic standard - rather than continuing to fill to capacity at the expense of secondary schools. 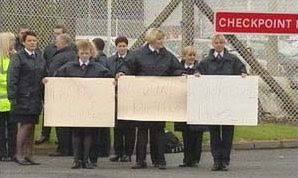 UUP education spokesman Basil McCrea said: “Under the DUP's proposals, a third of grammar school places could be axed. This would lead to the destruction of the grammar school sector. If the number of pupils going to grammar schools is cut to just pupils achieving As and B1s, many grammar schools will be unable to survive unless they ask for financial contributions from parents or go all-ability to increase their intake. The last section of the paper looks at the factors working against those who are still trying to retain academic selection. 18. Those opposed to the abolition of academic selection are adopting an entrenched position at present. This is to be expected while they seek to bring about a reversal or significant dilution of the current direction. “No complicated legislative changes, no need to have the backing of the Assembly or Executive and she wouldn’t even need to worry about officially banning academic selection forever from Northern Ireland. The Sinn Fein briefing paper states the party would seek to ‘persuade’ the majority of grammar schools to adhere to the department guidelines - which would of course not include academic selection as an option for schools. This persuasion would include any school that refuses to fall into line being forced to pay for their own entrance tests and they would also have to fund any legal challenges arising from this - risks already stressed strongly and publicly by the Education Minister. 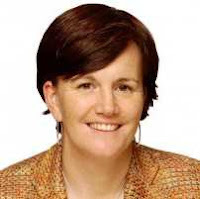 Added to this are a number of other factors - many introduced under Ms Ruane’s leadership - which will helpfully encourage reluctant schools in favour of selection to ‘adopt a more pragmatic approach’. These include the decline in the school-aged population and the department's power to set admission and enrolment numbers at schools. Schools are funded on a per pupils basis so could grammar schools’ intake be capped at such a low level that it may put their future in doubt? Given the dysfunctional power-sharing nature of our Stormont Assembly (consociationalism if you want to be precise), it is wholly unsurprising that Executive cannot yet determine a joint position on education. Maybe the Minister for Education is a wiser strategist than many imagine, knowing that it’s a debate that can never be resolved by in-public debate or by seeking formal cross-party consensus. But a third way, with a set of tensions set up by the department but self regulated by the grammar schools themselves may still be possible to pull off; one that delivers a more equal educational system in each region that won’t kill either the grammar or secondary sector. And maybe the other local parties would like to publish their most recent paper on post primary transfer so we can all see how their thinking differs. Doctor Who not downloading on iPlayer? Am I the only person who can't download Saturday night's episode of Doctor Who on iPlayer? BBC Three's Doctor Who Confidential has been available for streaming and download since Saturday night, but the main episode is still only showing for streaming. Hopefully not a repeat of the woes of end-February and beginning of March when lots of programmes failed to appear for download for days (seemingly due to difficulties in the incoming transcoding path) and some already-downloaded shows were even deleted from PCs before they should have expired. Update - Tuesday - Hurray! Three days late, The Fires of Pompeii is now downloadable from iPlayer. I’ve no real desire to add to the acres of words—not to mention the eons of electrons—that have already been expended on probing and analysing the use of Phorm by a number of Internet Service Providers (including BT, Talk Talk and Virgin Media)* to inspect user’s traffic and target their advertising accordingly. It’s been described as controversial and the legality of some aspects of the transparent service have also been questioned (specifically around the Regulation of Investigatory Powers Act 2000 that protects users from unlawful interception of information). Understandably, there’s been a lot less mention of the anti-phishing protection and fraud detection that Phorm would enable! There’s a Phorm Town Hall event in London at 6.30pm on Tuesday night (15 April) where you’ll be able to hear Richard Clayton speak along with representatives from Phorm. Technical presentation: Marc Burgess, VP Technology, Phorm Inc.
Commentary by Kent Ertugrul, CEO, Phorm Inc. The Belfast Telegraph ran a story today about a bmi check-in experiment about to descend on Belfast City Airport. It’s an extension to the online check-in and seat reservation service on flybmi.com. Passengers on Belfast City – Heathrow flights will also be given the option of getting a barcode sent to their mobiles, which will allow them to pass through security and the boarding gate by showing the barcode on their phone. Details are scarce, but the service is likely to rely on mobiles being able to receive and display incoming MMS messages, and may not be available to passengers checking in hold baggage. But soon it might be time to ditch the hassle of wandering around hotels and offices trying to find a PC hooked up to a printer that you can borrow for a few minutes to print off your electronic boarding card. Instead, it'll be a few clicks, and your mobile will go beep. PS: still no reply from either Ryanair or Belfast City Airport about Ryanair's hard-to-believe claims that 80% of their flights use flightpaths over Belfast Lough. Update - Sunday 13 April - Someone who left East Belfast forty years ago for the shores of Canada emailed this afternoon to point to a recent article in the NY Times highlighting Continental Airline's similar trial. Never mind Russell T Davies’ (largely unfounded) worries about the early start time of the new Doctor Who series on BBC One, Toby Hadoke’s one man show Moths Ate My Doctor Who Scarf is playing in London’s West End at the moment, starting at 7.30pm every night in the Arts Theatre! Not quite every night. It’s playing Wednesday to Friday at 7.30pm, as well as a Saturday Matinee at 3.30pm. This week and next. Tickets cost £15. Regular readers will remember that I enjoyed Hadoke’s comedy show when he played in Belfast’s Black Box as part of the Out To Lunch festival in January. For sixty minutes, Toby relived his life, growing up as a fan of Doctor Who. The ease with which he was ridiculed at school(s), the trouble attracting a girlfriend. And more importantly, emphasising the real world value that an unhealthy interest in Doctor Who can have - enriching minds though development of an interest in ecology, other cultures, travel, a sense of humour and a bit of science. 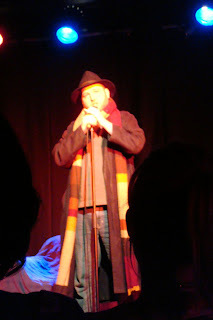 Local Whovians (and anyone who wants to hear some good comedy) can trip over Toby’s scarf in Coleraine’s Riverside Theatre for £10 on Thursday 15 May at 8pm. And until Saturday morning, you'll catch Toby on Listen Again talking about the show on Radio 4's Loose Ends with Clive Anderson. At lunchtime, I finally stumbled across the Blueprint image I'd been looking for to illustrate a previous post about energy creation from Strangford Lough's tide. Any idea whether it's Samson or Goliath? As previously mentioned, the first of twenty Sesame Tree episodes made its way onto Northern Ireland television screens on Tuesday ... scheduled just before Muppets Live Stormont Live. Thinking about birds, nests and what makes a home. Useful stuff in a community of home birds! Naming the bookworms Samson and Goliath was a lovely local touch. 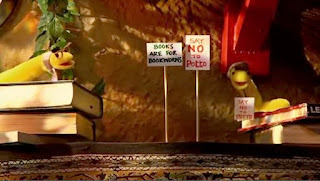 You’ll be glad to know that the bookworms got a lovely new house made out of some special books. Repeated early morning on Saturday and Sunday on BBC Two, and on iPlayer. In other TV drama news, Rogue Spooks which was renamed during development to Spooks: Liberty and has finally been re-announced as Spooks: Code 9 and may still be abbreviated down to Code 9 when it airs on BBC Three given the uncertain crossover with the main Spooks series. The scenario is that a nuclear explosion in London causes the country’s power base to shift north. MI5 is decimated, and rapidly restructures, establishing field offices across the UK, fast tracking new trainee officers into action. Spooks creator David Wolstencroft (a reasonable novelist too) along with a host of writers have created six new recruits who end up working in Field Office 19. Kylie (Georgia Moffett, Doctor Who) a psychology student, just back from her gap year. The series is still filming with no firm transmission date other than “later this year” on BBC Three. Rather than hiring out the bigger-than-they-needed-to-be MI5 offices at Palace Barracks Holywood, they’ve instead been filming in the old West Yorkshire Police HQ in The Tyrls, Bradford. 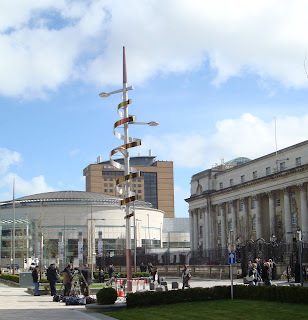 Cornmarket Arthur Square has had its competition and commissioned a piece of public art – nicknamed The Squiggle – to sit where the bandstand once lived. 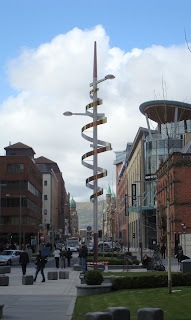 But Belfast Courts have now erected their very own squiggle overlooking the new bus death lane - complete with street light accessories! Monday night saw another recording. This time, the new Nolan-hosted quiz show Panic Attack. While half an hour of radio took about an hour to record on Saturday night, half an hour of TV took well over two hours. The quiz show takes the “we asked 100 people” elements of Family Fortunes, but pitches seven people against each other, eliminating one in each round. 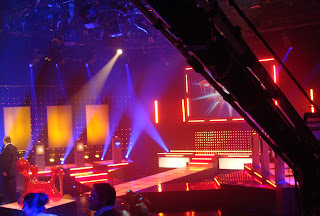 Big set, knobbly chair, a table that looks like something out of Blakes 7, beams of light cutting through a continuous supply of dry ice, and a selection of zany contestants. Given the elongated time it takes to film, perhaps the most fun moments came when things went wrong. Contestants fluffing their introductions (again and again) along with cheeky one-liners (“my radio’s covered in spit” from Jonie voicing his dislike of Nolan’s morning radio show). Update - they included a few of his other quips including his comment on Nolan's walk down the runway at the beginning of the show - "you've more mince than my fridge". And a wonderful moment when a male on-screen vox-popper was mis-labelled as Rebecca ... requiring fifteen minutes of head scratching and a new set of videos and questions to be brought forward from the next night’s filming. Bet someone had a busy Tuesday getting the original fixed! New quiz formats are rarer than hen’s teeth. Something as good as Who wants to be a millionaire comes around every five or ten years. And this, along with its “Don’t panic” catch phrase isn’t in that league. But cut down to half an hour, it'll have more action than an episode of Deal or No Deal! Update - having seen the completed show, it's been very well edited together, capturing the best bits, plenty of cheek, allowing personalities to shine through, and keeping it fast-paced by removing unneeded parts (like not bothering to show Ann walking off set - which took about ten minutes to get right on the night). There's the odd shot that could be improved - Round 2: Play or Panic - the background in the side shots of the contestants sitting at the Blakes 7 table look very grey and bland in comparison with the bright blue behind Nolan. And the explanation of the Round 2 rules takes too long and loses some of the pace the show had built up. And you've got to remember that Northern Ireland’s all about the local, all about townlands and suburbs and people with the same accent. And on those terms, Panic Attack scores highly with a very non-Belfast feel to it, and plenty of geographic variety. Should do it no harm in the ratings. Tune in at half nine from this Friday on BBC One if you want to join the more-loyal-than-you-could-imagine Nolan fan club who’ll be glued to their sets. I smell success for the newly formed (?) Lucky Monday Productions. Hmm ... Colin Murphy’s Great Unanswered Questions is a new radio show on Friday nights. 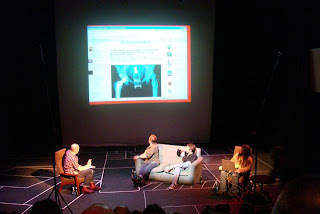 Recorded in the QFT’s small theatre space, the stage features a sofa and a couple of arm chairs. In a somewhat Baddiel and Skinner-esque fashion, sitting on those chairs are four people, enjoying a drink of beer and having a bit of a chat around the big unanswered questions of life. and a guest comedian/comedienne who helps ask and answer the questions. There’s a fair amount of background research done before the show records, but the banter abounds – parts of it unbroadcastable at 7.30pm on a Friday night – and displaying the search results (Cue sting: He’s a key-board wiz-ard) on a big screen makes for good radio. There’ll be an episode of QI for NI on Listen Again for the next month or so. And another update to a previous transport-related post. The Department for Regional Development & Efficient Movement of People has employed consultants Atkins & KPMG to investigate the possibilities for a rapid transit system in Belfast. The report has been published today and concludes that Belfast needs bendy buses rather than a light rail system. Unfortunately, not all the report is available on the DRD website ... not such a good example of devolved government public accountability. Update - website now fixed. Setting up a light rail system (£590m) would cost four times as much as a bus-based system (£147m), and the annual operating costs for rail (£6.78m) would dwarf those for buses (£1.44m). The report recommends that the running of the new public transport service should be put out to tender, though Translink would be free to apply. The pilot route proposals could later be augmented if the scheme proved successful. “This is our opportunity to create a new dynamic transportation system for the city, one that helps link people to jobs, hospitals, schools and colleges. One that links communities to the city centre and the emerging opportunities in Titanic Quarter. A system that can be expanded to other parts of the city in due course, a system that attracts drivers out of their cars as they see the advantages of rapid transit. However, a big disappointment in the report is that the case for extending the Titanic Quarter route out as far as the Belfast City Airport (and Holywood Exchange) is not thought to be economically viable. A combination of factors work against this common sense approach, including the cost of buying the necessary land, the commercial impact on Bombardier’s site (which would be dissected in places) and safety concerns getting access to the airport site due to proximity to the runway. No one seems keen yet to look at just running the buses along the Sydenham bypass! An update to a disturbing post from last August about two airport shop stewards who were sacked (along with another 20 colleagues) from their ICTS passenger security posts up at Belfast international Airport back in 2002. Despite a lack of support for their case from the TGWU, an industrial tribunal has found that the staff were unfairly dismissed by ICTS and that four shop stewards had been unlawfully discriminated against. A total of £750,000 compensation was awarded. ... was tinged with disappointment as the union had refused to support their members’ case going to tribunal. Two of the shop stewards involved - Madan Gupta (72) and Gordon McNeill (38) - were left with a legal bill of £200k from fighting their dismissal ... strange given that were union representatives. They threatened to go on hunger strike unless the union launched an inquiry and paid up. The previous action was postponed last September after Unite (Amicus and TGWU are merging into Unite) agreed to meet their demands within seven days. However those assurances failed to materialise. Update - lunchtime - Unite/TGBU posted their press statement as a comment below, setting out their very different (but less publicised) view of the ongoing dispute. Worth a read. Whatever the circumstances, it’s sad that the pair’s relationship with their union has been allowed over the years to deteriorate. Particularly, when unions are often the first to speak out about conciliation, mediation and the importance of good communications. “ROOFTOP protesters were winched to safety yesterday by the police search and rescue unit. The three sacked Aldergrove airport workers - Gordon McNeill, 38, Madan Gupta, 72, and Chris Bowyer, 49 - set up camp on Transport House in Belfast over claims they were not represented in an industrial dispute six years ago. “A statement from the union said allegations over reneging on paying the costs was ‘wrong’. Update - Saturday morning - Hunger strike was thankfully suspended on Friday evening after union give assurances and negotiations open up on compensation. Unclear if Unite/TGBU have issued a statement. Update - Saturday 26 April - Stumbled across an article that outlines some of the history of the long-running dispute from the side of the shop stewards. No sign of any action against Giles Coren who wrote up a corker of a review in order about Goodfellas in order to illustrate the freedoms the appeal judgement offered. The quickest way to bump a book up my reading list is to give me a copy. It worked for David Park and his latest novel The Truth Commissioner. And so too with Tom Watson MP (recently appointed as a Cabinet Office Minister with a long-time interest in technology, and the UK Parliament’s first blogger) who was so impressed when he read Clay Shirky’s book Here Comes Everybody: The Power of Organizing Without Organizations that he sent three free copies to commenters on his blog. It’s a thoughtful and insightful analysis of social networking and the power of transient and/or virtual communities. It arrived from Amazon, gift-wrapped in green paper about a week or so ago, and I’ve been working my way through it. At various stages in the week, it’s also been purloined and found its way to the other side of the bed. Two reads for the price of none! And the subject of a blog post later in the week. But as well as reading a book that looks at some of the online phenomenon of the last few years, on Saturday morning I surfed across to Simon Dickson’s latest online endeavour – the experimental website associated with the Promoting Prosperity: Progressive Governance Summit. A series of roundtable discussions held in a country house near Watford attended by twelve or so heads of state (prime ministers and presidents), representatives from the IMF, African Development Bank, WTO and a couple of UN programmes, along with Bill Clinton (The Clinton Foundation). Usually these events happen behind closed doors, with maybe 30 seconds of the closing press conference making the evening news bulletins. 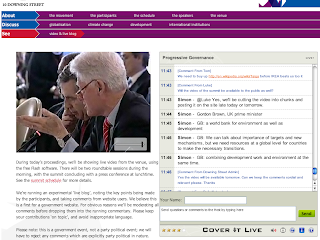 This time, as well as pre-publicising the four papers – and allowing online commenting – the video from the morning’s discussions were streamed online, along with an opportunity for online lurkers to pass comment and react to the world leaders’ thoughts. This is where Simon’s expertise came in ... setting up and running the website, as well as live-blogging the discussions. It was an experiment, and one that I hope is repeated. There were obviously limitations, particularly with no way for comments to be fed into the actual live discussions (though the comments will be passed to the participants afterwards). But it proved it was technically possible – hooking into much of the infrastructure (audio, video) that would already have been in place for the summit – with only two people needing to keep the online side running. I didn’t get the time to listen to a complete roundtable discussion – though I did eat my breakfast in front of it before nipping out to Reids to get Littl’un some new shoes ... white spotty ones for Spring! But despite the limitations, any means of opening up government and allowing voters and interested parties in the UK and beyond access to the thinking and rhetoric of the world’s movers and shakers is to be encouraged. Thank you Simon for getting stuck in, and no doubt tholing a fair amount of bureaucracy to get a Wordpress-based website up and running in the pm.gov.uk domain! Maybe they’ll hold the next Progressive Governance summit in Bangor? Parachuting in Hope to Belfast? 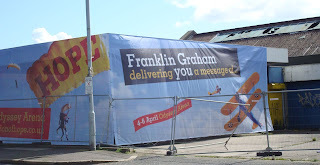 Driving up and down the Upper Newtownards Road, there's an old petrol station that's been temporarily covered in advertising banners for the Celebration of Hope event in Belfast this weekend. 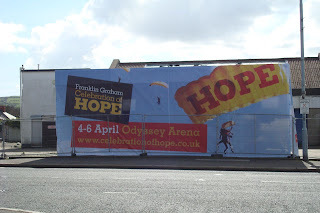 I'm sure the advertising agency didn't mean to leave me with an image of Hope being parachuted into Northern Ireland ... as part of a barnstorming performance in the Odyssey?